Ride-sharing is great for getting around town. 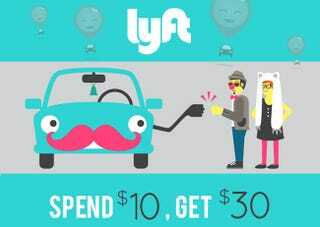 If you haven't heard of Lyft, it's a network of friendly drivers with mustachioed cars (rated by previous customers) who allow you to share their wheels for less than the price of a taxi. It's a neat solution…especially with $30 of credit for $10. Safe and Secure – See a picture of the car and driver when you book a ride. VIP Treatment – Passengers sit in the front seat; charge your phone and choose the music. Rate Your Driver – Lyft's built-in rating system is of the utmost importance. Highly-rated drivers give more rides, and low-rated ones are phased out. No Cash Necessary – All payments are made with a credit card through the app. Always On – Available 24 hours a day, 7 days a week. Compatible with iPhone and Android. Please check this list to make sure your city is covered. Bear in mind that this is for new Lyft customers only. Head for the link below to get this offer and all the T&Cs.